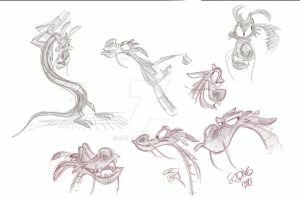 This was done by request for an old Disney buddy who worked on the Mushu clean up unit. Is this Mushu is a thin dragon? He is a funny dragon. Self centered, but funny. What kind of markers you're currently use,MR.Bancroft!? I think I need to find those things to try them! Can't get enough of your Mushu. Oh Mushu you loveable dragon.